After seeing the new how-to videos that Google has released for the Nexus 7, first the general how-to about getting started with your new tablet, then the how-to about using various Google Apps, we knew that there would be another video coming as a how-to for the Google Play Store. Now, we have that video, and it is pretty much what you'd expect. 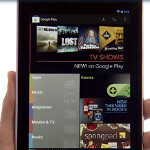 The video goes through the content available in the Play Store and how to access it from various apps on your Nexus 7. The video highlights new content like magazines, specifically going into the new Google Magazines app itself, and really just mentions the other content available. Of course, there is also the standard message that all of your content will be "instantly available" to your other devices, and Google even points people towards the Play Store website as a place to access that content. We think Google may have to make the links to personal content ("My Books", "My Videos", etc) on the Play Store website more prominent, but it's always good to show people how much the website has to offer. The video also finds a bit of time to highlight the new widgets that Google has created in Jelly Bean, specifically the new Play Store recommendation widget which helps you find new content that you may want to purchase in the Play Store. Definitely a good amount of info in a video that's just 1:14 long. Haha, demonstrating how the experience also works on a Mac. That's some quality trolling on behalf of Google! Nice touch! Alright, so how do you explain Apple trying to shut down the Galaxy Nexus then? Even though it's made by Samsung, it is Google's flagship smartphone. Don't forget that Google played a huge part in the phone's design too. And still Google shows Macs and iPhones on its keynotes and no Microsoft products. How do you explain this? Some primitive trolling on important marketing events or Google rather allying itself with Apple rather than Microsoft? You're right saying Cupertino don't seems to return the warm feelings yet, trough. But an Apple/Google alliance would mean an monopoly on the exploding market of mobile devices which could mean the end of the Microsoft era. Im trying to access the play store with my nexus 7 but its says "Error retrieving information from server. [DF-DFERH-01]" . Im from Puerto Rico and there's a lot of people form here and UK getting the same message.